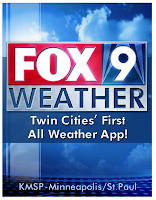 Fox9 has made a big deal promoting its newly released weather application for mobile phones. While the app has a few nice features (good radar, alerts and ability to mark favorite locations), there is a discrepancy between the application and the weather television presentation. Note that for Tuesday through Thursday the variance in high temperatures is considerable, with an eight degree difference on Thursday. There are also differences where the weather app icons show rain while the website icons show sun. 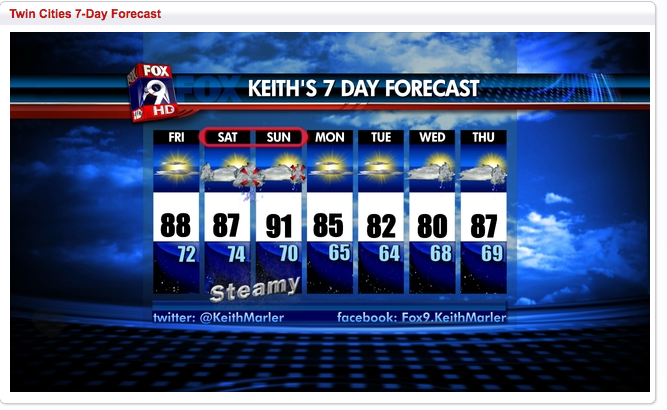 It's hard for us to take a station's weather app seriously when there is such a difference. Our guess is that the source for the app's weather forecast is not made by the on-air mets. The app appears to be produced by the WSI Corporation, which produces weather forecasts of its own through places like Intellicast.com. Fox needs to square this issue before it can expect its mobile phone viewers to take the new app seriously. So Bill you once hung with Ian Leonard,did you ask him whats with the differences. BTW--your next post should be on the heat wave coming at the end of the week,how hot and for how long,looks like 3+ days of 90's,close to 100! I'll be honest...so long as the app has the current temp right, and tells me when my town is about to get slammed on radar, I could care less about forecast discrepancies. Great points of discussion, though. 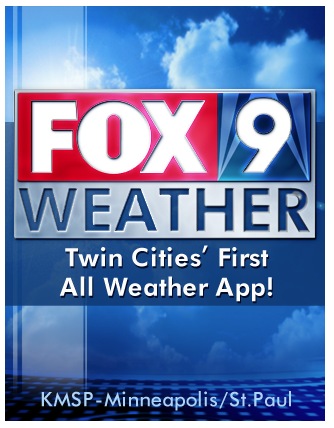 Hopefully the Twin Cities "only" all-weather app figures out the importance of being programmed locally - not by an east coast service provider! I think it's a really great tool. It can definitely help you constantly updated when it comes to the weather. This weather tool is a bit off from the website. I wish they could just collate the data to make them the same. It'll be good if they're going to make an app for iPhones, and Android and smart phones. That will be very convenient for us. I'll probably buy that app because it can help me in a lot of ways. I need updates about the weather and I'm glad they made such an app. Is this app any good? I have limited storage space left, so I can only download must-haves. Thanks for sharing this app but I think there's more accurate applications that tell the weather. Just like Yahoo Weather widget. You can also use free SEO tools online. Jumpy Frog - Road Cross Use on screen controls to move the frog. Cross the road and canal, get to the finish line to win the game.